“Success is uncommon and not to be enjoyed by the common man,” coach Cal Stoll told the young college bound Tony Dungy and the rest of his University of Minnesota football teammates when faced with the reality of working in the game of life. “I’m looking for uncommon people because we want to be successful, not average,” Stoll said. The New York Times bestseller chronicles a man eager to share his story from working as a staff coach on a football team to becoming the first black head coach to win a Super Bowl. Dungy’s system in football of being patient and prepared before reacting to the moment combined with his faith-based priorities is carefully outlined in the book. This is a good book with a lot of substance, and if only one sentence has touched you, the book has done its job. This memoir, which can be bought for $9.99 at Barnes and Noble online, doesn’t represent a prototypical head coach. 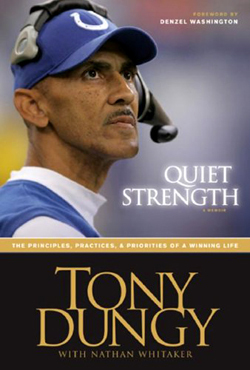 This book includes recollections of Dungy at an early age, working his way to the top of the corporate sports ladder, starting a family, and using his faith to guide him through the loss of his young son. This is not a sports book, but a book that promotes family and becoming better individually every day. Readers will enjoy this book because it’s so uplifting. The book will motivate them to take care of today, and focus on the next day. The stories and examples presented in this book give the reader more of a basis to reflect on what great things are to come in the future. The writing in this book is very patient, very easy to read, and understand. Readers won’t get lost in the book, for the words will “hold your hand” and bring them through each page. The foreword by Denzel and Pauletta Washington only makes the book an even better read as he and his wife express their love and respect for a man whose dignity goes beyond the football field. “Quiet Strength” sustains a wonderful flow and reaffirms that all things are possible and there is a way to tackle every difficult situation. From start to finish, readers will be reminded that being quiet can truly be the loudest voice of all. The concept of this book is very simple, and it complements the everyday reader. “Quiet Strength” sets out to prove in order to become the best at what a person does, he has to live with what he is born with, work hard and be different.